You guys. I made the salad of my dreams the other night. No joke. It was everything a salad should be, namely full of texture and flavor. To be fair, I didn’t come up with it all on my own. I was inspired by the Loaded Lentils salad I had at Café Karibo in Fernandina Beach a couple of weeks ago. 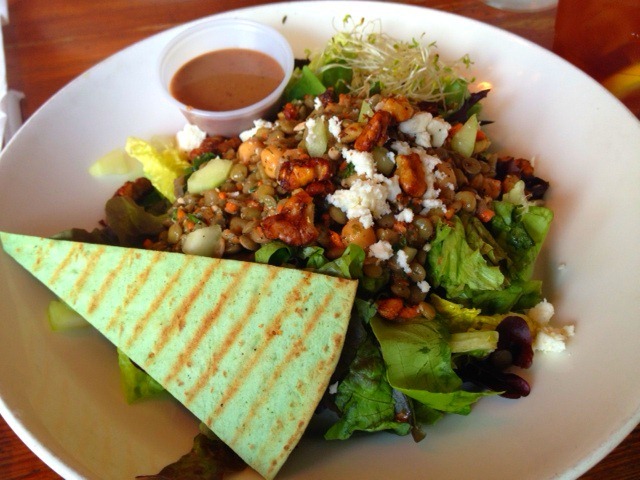 I loved the idea of combining lentils, chickpeas, feta and walnuts. I’m pretty sure I licked my plate clean. And then came another sign that I needed to make a salad with lentils in it. 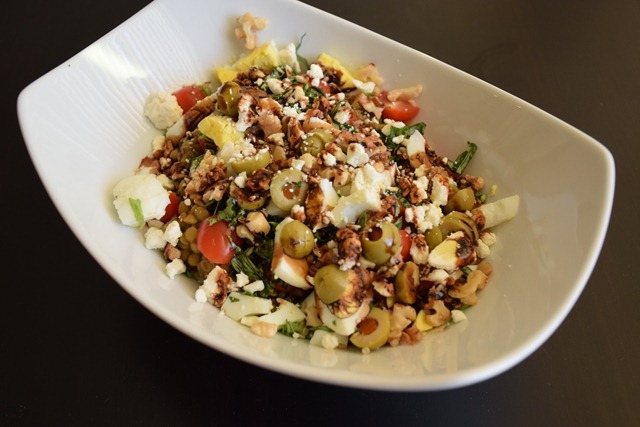 Jen posted a recipe for a Mediterranean Lentil & Couscous Salad that looked incredible. And that was that. Lentil salad was added to my weekly meal plan. So like many of the things I make, this is a “recipe.” This means that ingredients can be swapped out and measurements can be adjusted based on personal preferences. 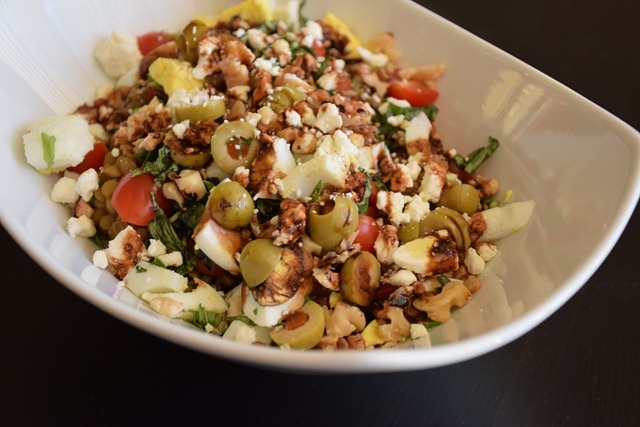 For example, I can totally see this salad looking slightly different the next time I make it…instead of using walnuts, I may use pumpkin seeds. A small example but you get the picture! With that being said, I’m not going to state exact measurements for the ingredients below. I will, however, note how much of each ingredient I used. And I suggest making/prepping more of the things you like so that way you can make multiple salads during the week. Trust me, you will want to eat this more than once! Starting with the spinach and ending with the basil, add each ingredient to a large bowl. Drizzle ~one tablespoon of the balsamic glaze and 2 teaspoons of olive on top of the salad. Mix and enjoy! I used Trader Joe’s Small Whole Green Lentils, but I’m guessing any kind will work. In a saucepan, combine 1 cup lentils (sorted and rinsed), ¼ cup white wine (I used Chardonnay), 2 ¼ cups vegetable broth, and ¼ teaspoon black pepper. Bring to a boil and then reduce heat and allow to simmer for 35 minutes. When the lentils are done cooking, add a couple pinches of salt and mix well. Heat a small frying pan over low heat and add a couple handfuls of walnuts. Every couple of minutes, toss the walnuts around in the pan (this ensures that they don’t burn). Do this for ~5-7 minutes. As soon as they start to brown, try a piece. If it’s crunchy, you’re good to go. If not, keep toasting for a few more minutes. Heat a small sauce pan over low-medium heat. Add ½ to 1 cup of balsamic vinegar to pan and allow to simmer. I know this sounds like a lot, but it reduces to less than half the original amount! You know the glaze is done when it coats the back of a spoon. So I know this sounds like a lot of work, but it’s really not because a lot of these ingredients can be prepped ahead of time. And in my opinion, it’s well worth the (very minimal) effort! What are your salad must-haves? Oh Parita – this salad could make me so so happy! I don’t think the prep work is too much at all – in fact, there’s nothing to dislike about this plate of deliciousness! I love boiled eggs, olives, nuts and beans in my salads – so this salad plus some beans and a couch and ooh am a happy camper :)! Hope your weekend is wonderful! If you love those things, this one is for you! And the best part is that it’s totally something you can customize per your taste. The only thing I wouldn’t skip is the balsamic glaze…it added so much good flavor! That salad looks AMAZING! Alex and I are trying to eat clean before the wedding and this would totally fit the bill! You guys should definitely make it. It’s delicious AND filling! Loving all the different flavours and textures in this salad. Especially as it’s gotten almost unbearably hot here, salads are just about the only thing that sound appealing right now. Lately I’ve been obsessed with pumpkin seeds & alfalfa sprouts! I was so sad when I was down to the last bite! It was THAT good! And I think both pumpkin seeds and alfalfa sprouts could be added to this salad – they’d add the perfect crunch! This is looks so amazing! Feta and olives are one of my favorite combos. Pinning this now!